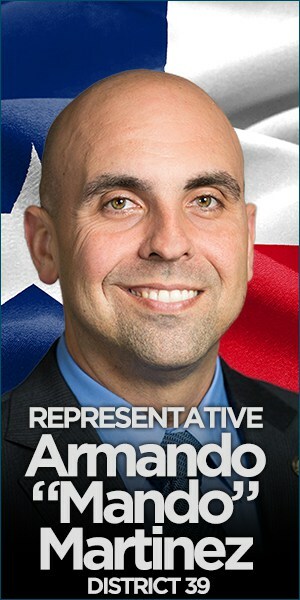 Edinburg will be the center of Democratic political action on Wednesday evening, May 9, when dozens of candidates for offices in Hidalgo County – including for the open House District 40 state representative seat based in Edinburg – along with sheriff, state senator, and U.S. representative, will gather at the Courtyard at Edinburg City Hall to meet voters. The event, which is being sponsored by the Hidalgo County Democratic Party, is free and open to the public. It will be held from 6 p.m. to 9 p.m. 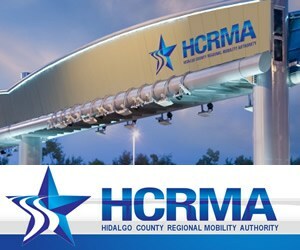 In a related development, polling locations have been finalized by the Hidalgo County Elections Department and are available on its elections website,http://www.co.hidalgo.tx.us/elections. Early voting for the 2012 Democratic and Republican primary elections begins on Monday, May 14, and ends on Friday, May 25. Election day for the party primaries is Tuesday, May 29. See story on Elections Department preparations later in this posting. 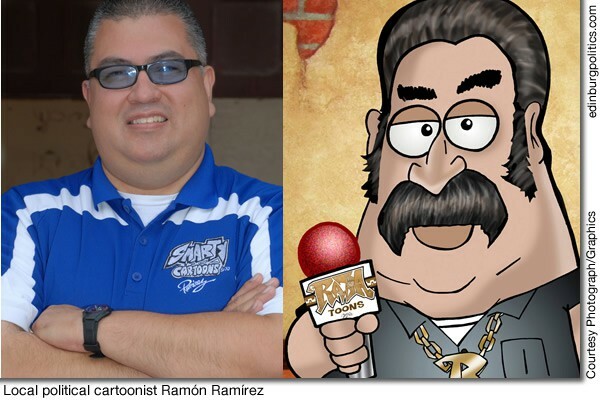 Ramón Ramírez, Jr., an educator, cartoonist and motivational speaker with 20 years of experience in teaching and 25 years of experience in cartooning, will be the featured artist on Friday, May 11, during Jardín del Arte at the Courtyard at Edinburg City Hall. The outdoor event, which is free and open to the public, will be held from 7 p.m. to 10 p.m. at the venue, located at 415 West University Drive. In addition to Ramírez’ work, the May 11 Jardín del Arte will showcase art exhibitions from other local artists plus live music. Area residents who attend will be able to purchase food and beverages from participating Edinburg restaurants and vendors. Ramírez is known for creating projects such as Teacher Toons, Only in the Valley, Dating Toons, Social Work Toons, and his latest project, Raza Toons. See story later in this posting. Edinburg school board member David Torres, featured left, and Juan R. López, AICP, Director of Planning and Zoning for the City of Edinburg, wear hair nets and sanitary gloves as they help serve meals to youngsters on Friday, April 20, as part of the celebration of Boys and Girls Club Week in Edinburg. 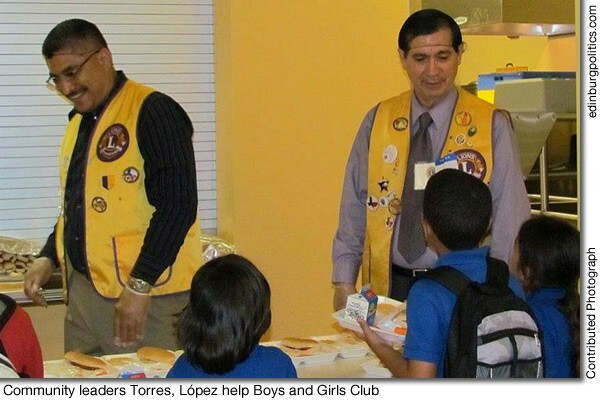 Torres and López were participating in the event in their roles as community leaders, joining other members of the Lions and Kiwanis Clubs of Edinburg and the Edinburg Volunteer Fire Department during the Kids Café Program. “We wanted to provide a positive environment where the kids, firemen and civic leaders could interact,” said Sabrina Walker-Hernández, Chief Professional Officer for the Boys & Girls Clubs of Edinburg RGV. “The kids were really impressed that they all took the time from their schedules to serve them.” The ‘servers’ not only assisted in food preparation but they also served more than 230 meals and drinks to the Club kids. During their interaction with Club members, the community leaders asked the youngsters questions, and the children learned about their guests’ respective organizations. The Club has moved its main site and administration to its new building, The Legacy Center, located at 702 Cullen Street (Rogers Road and U.S. Expressway 281). The Club offers programs that emphasize character and leadership development, education and career development, health and life skills, the arts, and sport, fitness and recreation. 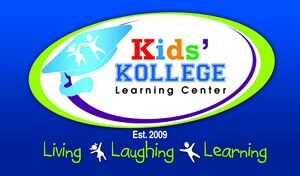 Log on to http://www.EdinburgKids.com for more information about the Club or by calling 956-383-2582. Members from Edinburg Arts, the City of Edinburg, the Edinburg Economic Development Corporation, and the Dustin Michael Sekula Memorial Library recently met with the Mexican Consulate to discuss ongoing plans for a Cinco de Mayo Celebration and Mexican Artisan Fair in Edinburg scheduled for Friday, May 4, and Saturday, May 5. Artisans from Mexico will be selling their wares, including candies, textiles, artwork, jewelry, home décor, toys, a variety of foods, spices and more. Mariachi and Ballet Folklorico also will be featured. Special guest Dr. Bernardo Ibarrola, a Mexican historian, will be speaking about Cinco de Mayo and why it is celebrated. Among the other festivities will be an art exhibit, organized by Edinburg Arts and the University of Texas Pan-American, that will be on display in Edinburg City Hall. A Cinco de Mayo Salsa Contest will include prizes. More information on the two-day celebration is available by e-mailingEvana@edinburgedc.com or by calling 956/383-7124. 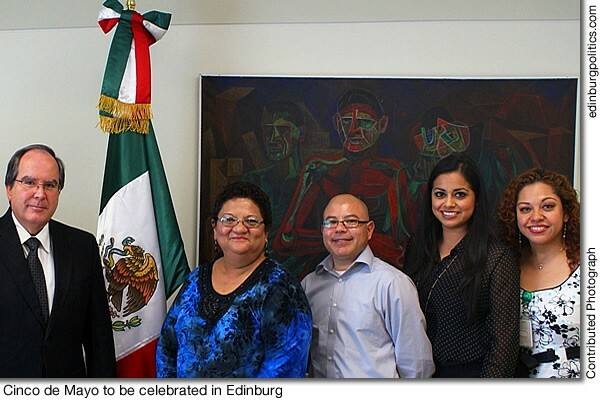 Featured, from left: Erasmo R. Martínez, the Mexican Consulate; Letty Leija, Director, Edinburg Public Library, José Martínez, Assistant Director, Edinburg Public Library; Alyssa Chapa, Public Information Specialist, City of Edinburg; and Claudia MA. 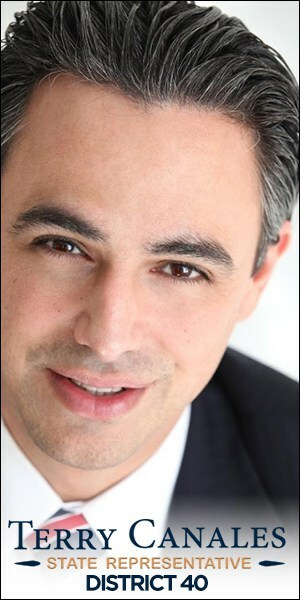 Trujillo Hernández, Coordinator of External Affairs, Mexican Consulate. Congressman Rubén Hinojosa, D-Mercedes, who also serves as 1st Vice Chairman of the Congressional Hispanic Caucus (CHC), on Friday, April 20, joined other members of the CHC, DREAM Act activists and young Latino voters on Capitol Hill to denounce a new and developing version being proposed by Sen. Marco Rubio, R-Florida. First introduced in Congress in 2001, the DREAM (Development, Relief, and Education for Alien Minors) Act proposes to provide conditional permanent residency – which in some cases could lead to citizenship – for certain undocumented children. A version of the DREAM Act, which passed the U.S. House of Representatives in December 2010 but was blocked from receiving a vote in the U.S. Senate, is supported by Hinojosa. But many Republicans fear that version could lead to amnesty for undocumented residents. Under a proposal being floated by Rubio, undocumented residents who met standards of the DREAM Act could stay in the U.S. indefinitely, with a special immigration permit, but they would not be granted citizenship unless they went through the U.S. naturalization process. See story later in this posting. 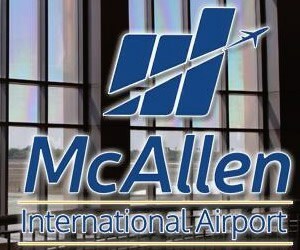 Congressman Henry Cuellar, D-Laredo/McAllen was honored on Wednesday, April 25, as a “Champion of Healthcare Innovation” by the Healthcare Leadership Council, a coalition of leaders of the nation’s premier healthcare companies and organizations. The award ceremony took place in Washington, D.C. “As a representative of one of the most uninsured districts in the nation, expanding access to quality, affordable healthcare is a priority of mine because far too many people in South Texas live in medically underserved communities, and far too few of them have the insurance they need,” said Cuellar. 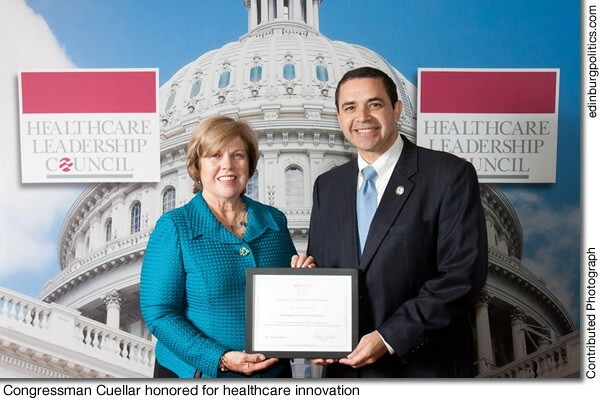 “I am honored to receive this award for my work to support and expand America’s health care system, and I thank the Healthcare Leadership Council for promoting these important goals.” Mary R. Grealy, president of the Healthcare Leadership Council, presented Cuellar with the honor. See story later in this posting. 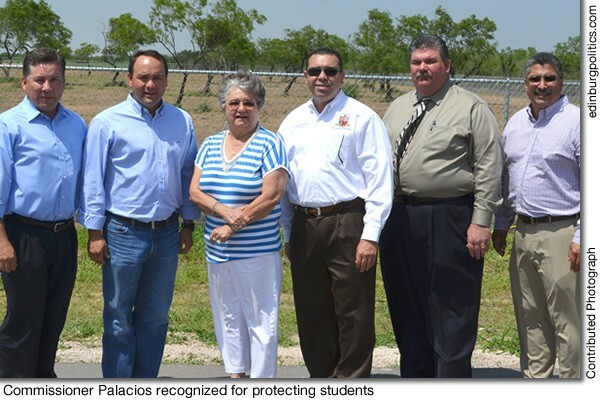 Hidalgo County Precinct 4 Commissioner Joseph Palacios, featured second from left, on Monday, April 2, was recognized by Edinburg school and city leaders for his and his staff’s work on a protective barrier at Betty Harwell Middle School. On Tuesday, January 24, Dr. René Gutiérrez, superintendent for the Edinburg school district, addressed the Hidalgo County Commissioners Court and secured an interlocal agreement between Hidalgo County Precinct 4, led by Palacios, and the Edinburg school district to provide for the construction of protective barriers around Carmen Ávila Elementary and Harwell Middle School. This action represented a solution to an issue that was widely publicized late last year, when two middle school students were injured after being hit by stray bullets from a nearby ranch. Through the agreement, Precinct 4 donated dirt to help construct protective barriers to surround the school. The school district shall pay the county for materials, equipment and personnel costs for construction of the protective barrier. Gutiérrez hopes the joint program will decrease the possibility of any future occurrences and help to ease some of the concerns for safety and security of students at the schools. Featured, from left: Juan “Sonny” Palacios, Jr., vice president of the Edinburg school board; Commissioner Palacios; Carmen González, president of the Edinburg school board; Superintendent Gutiérrez; Shawn Snider, acting city manager for Edinburg; and David Torres, member of the Edinburg school board. 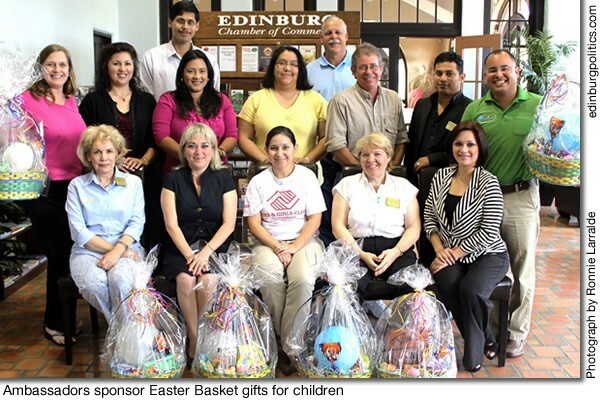 Ambassadors for the Edinburg Chamber of Commerce (ECOC) on Wednesday, April 4, presented an early Easter present to 10 children from the Edinburg Boys and Girls Club. The colorful baskets, which were filled with candy and toys, served as a symbol of love and joy for the youths. Area businesses donated funds for the gifts. The ECOC Ambassador program is a group of members who act as public relations representatives of the chamber. Featured, first row seated from left: Lidia Díaz, representing All Tune and Lube; Letty González, president of the Edinburg Chamber of Commerce; Cindy Castillo, representing the Boys and Girls Club; Charlene Kurpel, representing Thrivent Insurance; and Mary González, representing Texas National Bank. Standing, middle row from left: Flo Prater, representing Rio Valley Realty; Naomi Perales, representing Texas Gas Services; Dina Araguz, representing International Bank of Commerce; Patricia Galindo, representing Valley Land Title Company; Marty Martin, representing Rio Valley Realty; Juan Tijerina, representing RGV-Statewide Insurance; and Alex Ríos, representing Kids Kollege Learning Center. Standing, back row from left: Martín Rivas, representing the Edinburg Chamber of Commerce; and J.P. Tilburg, representing Security Depot, Inc. More information on the Ambassadors program and the chamber is available by calling 956/383-4974 or by logging on to http://www.Edinburg.com. The Rio Grande Valley Hispanic Chamber of Commerce will host a Mothers Day Extravaganza on Thursday, May 10, from 5:30 p.m. to 8:30 p.m. at the Legacy Event Center in Edinburg. The highlights of the evening will include the announcement of the “Mother of the Year”, when five deserving women – living and deceased – will be recognized for their remarkable lives. Tickets for the event are $25 each, reserved tables of 10 are $300 (with priority seating), and sponsorships that include a display table range from $500 to $3,000 each. Exhibitor tables are also available for those wishing to sell their items or services. For more information on the Mothers Day Extravaganza, please call the RGVHCC office at 928-0060. 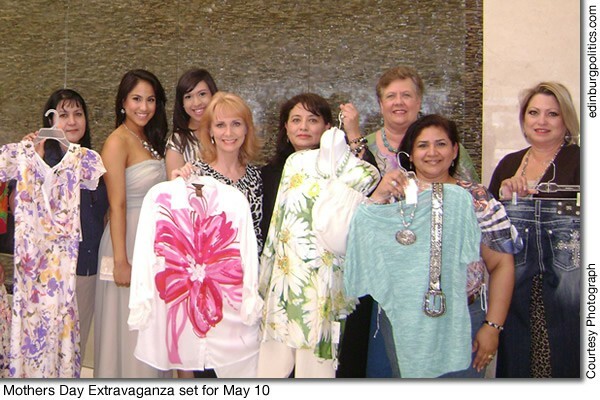 Featured, from left, are representatives of the stores participating in one of the evening’s events, the Style Show: Gloria Treviño (WalMart); Anyssa Dimas and Destiny Rodríguez (Spa La Posada); Becky Malcik (Bec’s Fashions); Anna Hernández (Our Secret); Marti Miller (member of the host committee); Mary Dumond (Boot Jack); and Yoli González, (member of the host committee). 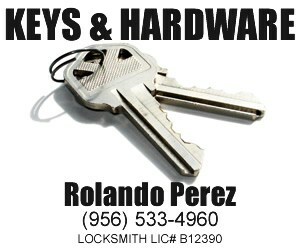 Other key sponsors are Wells of Weslaco and Olivia’s Fashions. See story later in this posting. Edinburg’s retail economy, as measured by the amount of local and state sales taxes generated by a wide range of local businesses, and the city’s job market both posted growth, according the latest state reports, the Edinburg Economic Development Corporation has announced. The city’s retail economy in February 2012, according to an April 11 posting by the Texas Comptroller of Public Accounts, improved 10.49 percent over the same month in 2011. In February 2012, the city’s retail economy generated $1,246,271.02 in local sales taxes compared with $1,127,941.23 during the same month last year. Meanwhile, the city’s job market in February 2012, according to figures released on March 30 by the Texas Workforce Commission, showed Edinburg’s unemployment rate was 7.7 percent, an improvement over the January 2012 unemployment rate of 8.2 percent. By comparison, the average of the unemployment rates for all cities in Hidalgo County in February 2012 was 11.1 percent. 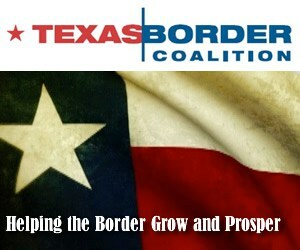 During February 2012, according to the Texas Workforce Commission, there were 32,462 people employed in Edinburg. 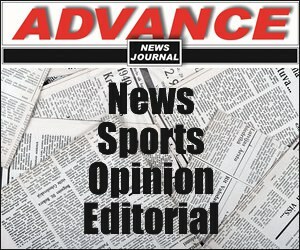 During February 2011, there were 31,638 people employed in Edinburg, the state agency reported. Nelda T. Ramírez, Executive Director for the EEDC, said the mayor, city council, and EEDC Board of Directors have been influencing economic growth on many different levels, such as by enacting pro-business policies, wisely investing public funds in key infrastructure projects, and helping rally legislative support in Austin and Washington, D.C. for state and federal funds for Edinburg priorities. Among the EEDC’s most effective strategies has been to successfully herald the outstanding quality of local firms, the city’s deep and talented pool of a professional, highly-skilled workforce, and the excellent goods and services available in Edinburg. Another popular city/EEDC event, the monthly Jardín del Arte, which showcases the city’s rich cultural and artistic communities, allows Edinburg businesses to introduce themselves to hundreds of local and Valley residents in the beautiful environment of the City Hall Courtyard, she added. Jardín del Arte is part of the community’s plan of action to incorporate the local arts community into economic development goals. Jardín del Arte was created in 2011 in order to feature the fine arts talent in the three-time All-America City. The EEDC, the City of Edinburg, the Dustin Michael Sekula Memorial Library, and the Edinburg Arts/Cultural Activities Board are sponsors of Jardín del Arte. Publicizing the community’s achievements is not the only economic development tool being utilized by the EEDC. In May, the EEDC will be kicking-off the I SHOP EDINBURG campaign for the summer, and in June, a third major job fair will be held – both proven strategies designed to help power the local economy and create more jobs, she added. I SHOP EDINBURG is a marketing program, sponsored by the EEDC, the City of Edinburg, and the Edinburg Chamber of Commerce, which provides, at no cost, a card that qualifies shoppers to receive discounts or other incentives on goods and services offered by participating local merchants. After a lengthy and delayed process to get the 2012 primary elections underway due to federal and state redistricting, the Hidalgo County Elections Department has been working diligently to ensure that the county government is prepared for the 2012 primary elections. The Elections Department has had to redraw voting precinct lines, move voters into their new precincts, confirm addresses, and mail out new voter registration certificates, all the while preparing the voting machines and ballots for the elections that will be held in May by some cities and school districts, as well as for the Democratic and Republican Party primaries. Elections Administrator Yvonne Ramón urges residents to be aware of several key issues regarding the 2012 primary election process. Precinct redistricting Every 10 years after the Census is completed, the Elections Department reviews voting precincts to align with redistricting of local, state and federal districts. The Elections Department redrew voting precinct boundaries to accommodate the changes, resulting in an increase of voting precincts in Hidalgo County. Registered voters are encouraged to see whether their precinct changed by visiting the Elections website at http://www.co.hidalgo.tx.us/elections. Address confirmations In mid-April, the Elections Department mailed out more than 22,000 letters to registered voters whose descriptive physical addresses were incomplete, indecipherable, or contained insufficient information to assign to a new voting precinct. These letters are an attempt to revise incomplete addresses in the system and ensure that the registered voters are placed in their correct assigned voting precinct. Ramón urges recipients of the letters to respond accordingly with their 9-1-1 address or a descriptive address with at least the nearest street intersection and the direction on the street (north, south, east, or west) so that the Elections Department can correctly identify their physical location. Making these corrections in a timely manner will ensure that voters do not experience a delay when they arrive at their polling location; those registered voters whose addresses remain insufficient will be asked to update their address information before they are allowed to vote. Voter registration certificates The Elections Department has mailed out the new voter registration cards, and registered voters were to be on the lookout to receive their card. The new cards are canary yellow in color, and will have voters’ new voting precinct, if it changed. Monday, April 30, was the deadline for any changes to be made by voters on the voter registration certificates they received. Primary elections schedule Polling locations have been finalized and will be available on the elections website athttp://www.co.hidalgo.tx.us/elections. 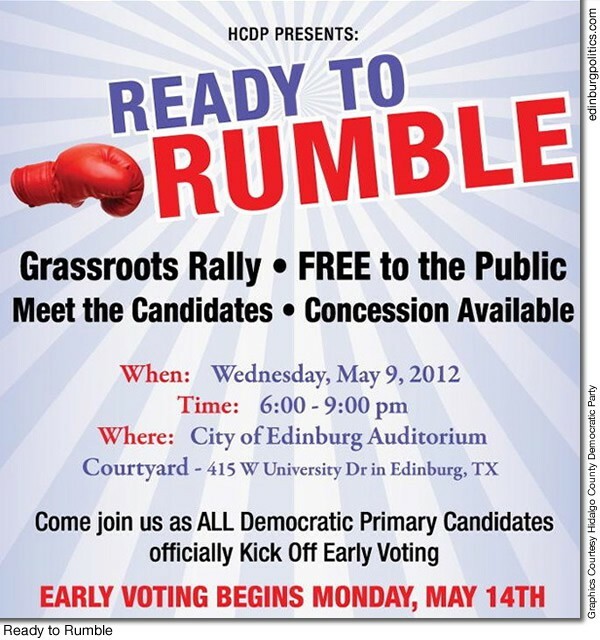 Early voting for the 2012 Democratic and Republican primary election begins on Monday, May 14, and ends on Friday, May 25. Election Day is Tuesday, May 29. For more information on local and county elections, contact the Elections Department at956/318-2570 or visit the website at http://www.co.hidalgo.tx.us/elections. A torrent of changes have besieged the Rio Grande Valley’s health care delivery system, causing treatment clinics to curtail their services, pharmacies to close, and creating an access to care issue that has left thousands of Medicaid patients without health care. At a news conference on Thursday, April 25, at the Mission Chamber of Commerce, Rep. Sergio Muñoz, Jr., D-Mission, explained the new policies that the Health and Human Services Commission (HHSC) has adopted regarding their Medical Transportation Program. The state’s re-interpretation of the law and pertinent rules have caused a major curtailment to access to care for children who are served by children’s therapy centers. The first blow came with a legislative change that cut reimbursement for physicians who serve patients eligible for both Medicaid and MediCare. Then, on March 1, the new health care delivery system for Medicaid patients was rolled-out in South Texas, known as “managed care,” whereby a set of managed care organizations have been named to administer the Medicaid program. An estimated 400,000 residents are being impacted. Within weeks of the controversial transition to managed care, the Managed Care Organizations, through their Pharmacy Benefit Managers, allowed the reduction of a set of reimbursement rates for pharmacists, forcing many of our local pharmacies to close their doors. The latest of these changes are two mid-March 2012 Health and Human Services Commission (HHSC) policy changes to their Medical Transportation Program (MTP), the first of which disallows transportation to therapy clinics for children under 15 years of age unless accompanied by a parent or guardian. Secondly, once at the therapy center, therapy is allowed only if a parent, guardian, or eligible consented adult is present. This change has created a devastating effect on patients and providers alike. Muñoz has had several meetings with the commission to look for solutions to the challenges that the changes have created. Regarding changes to the MTP, Muñoz encourages all providers to abide by the current policy changes, but pledges to continue his work to find a compromise that will offer relief. At a recent meeting with Tom Suehs, who is HHSC Executive Commissioner, Muñoz and Sen. Juan “Chuy” Hinojosa, D-McAllen, the three leaders mutually agreed that a regional approach has to be taken when considering such important state policy. Muñoz has called for HHSC to suspend the new MTP policies, but to date the agency has no plans to do so. He and other Valley legislators are also calling for the agency to cease any new policies or rules that would cause a disruption in services, saying that our medical community requires a chance to stabilize. Meetings will continue until a set of solutions can be agreed upon. 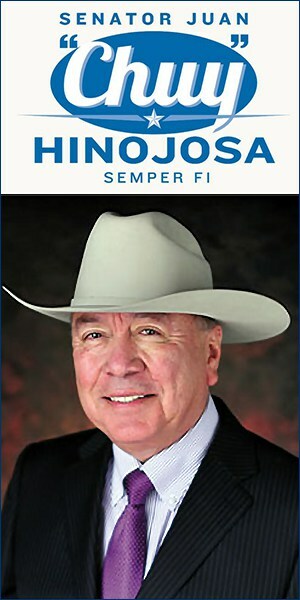 The Texas Hospital Association’s state political action committee, HOSPAC, on Monday, April 23, endorsed Sen. Juan “Chuy” Hinojosa, D-McAllen, for Texas Senate District 20. One of the largest hospital associations in the country, THA represents more than 85 percent of the state’s hospitals and health care systems, which employ some 369,000 health care professionals statewide. The 33-member HOSPAC board makes endorsements based on a candidate’s position on health care issues and input from local hospital representatives. Learn more about HOSPAC at http://www.HOSPAC.org. About the Texas Hospital Association Founded in 1930, the Texas Hospital Association is the leadership organization and principal advocate for the state’s hospitals and health care systems. Based in Austin, THA enhances its members’ abilities to improve accessibility, quality and cost-effectiveness of health care for all Texans. Learn more at http://www.tha.org or follow THA on Twitter at http://twitter.com/texashospitals. Ramón Ramírez, Jr., an educator, cartoonist and motivational speaker with 20 years of experience in teaching and 25 years of experience in cartooning, will be the featured artist on Friday, May 11, during Jardín del Arte at the Courtyard at Edinburg City Hall. The event, which is free and open to the public, will be held from 7 p.m. to 10 p.m. at the outdoor venue, located at 415 West University Drive. In addition to Ramírez’ work, the May 11 Jardín del Arte will showcase art exhibitions from other local artists plus live music. Area residents who attend will be able to purchase food and beverages from participating Edinburg restaurants and vendors. Jardín del Arte (Garden of Art) is a publicly-sponsored event which highlights Edinburg’s rich cultural and artistic communities. Jardín del Arte is part of a plan of action, sponsored by the City of Edinburg, the Edinburg Economic Development Corporation, the Dustin Michael Sekula Memorial Library, and the Edinburg Arts/Cultural Activities Board to incorporate the local arts community into economic development goals. The Edinburg Economic Development Corporation (EEDC) is the jobs-creation arm of the Edinburg City Council. Ramírez is known for creating projects such as Teacher Toons, Only in the Valley, Dating Toons, Social Work Toons, and his latest project, Raza Toons. Smarty Cartoons – the name of his business – is supportive of all creative forces that generate a positive vibe among the creative realm, according to his website,http://www.SmartyCartoons.com. This creative force is sure to make you smile and help you seize the day with laughter. Smarty Cartoons began in 1987 and this year celebrates its 25th anniversary. 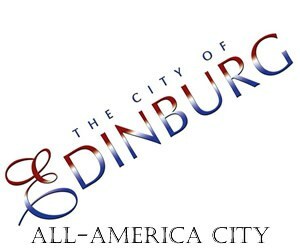 Area residents interested in exhibiting their artwork may go online for more information athttp://www.EdinburgArts.com. There is an application process and fee in order to participate in Jardín del Arte, which is held the second Friday of the month from April through November. Prospective participants are asked to submit images of their work, which is reviewed by a selection committee. Those images may be sent via e-mail to Evana@EdinburgEDC.com, or for more information on how artists, musicians, or vendors may participate in Jardín del Arte, contact the EEDC at 956/383-7124. The mission of Edinburg’s Cultural Activities Board (CAB) is to preserve, promote, develop and encourage the community’s cultural expression and enhance the quality of life in the City of Edinburg. Edinburg’s CAB will promote a nurturing environment to advance the knowledge, discovery and engagement in visual/performing arts, creative writing, music, dance and other forms of self-expression. Updates and other news developments are available online at http://www.EdinburgArts.com. Congressman Rubén Hinojosa, D-Mercedes, on Thursday, April 12, announced IDEA Public Schools in Weslaco was awarded an $11.5 million grant by the United States Department of Education under the Gaining Early Awareness and Readiness for Undergraduate (GEAR Up) Partnership Program. The grant is in the amount of $1,653,899 annually for the next seven years, totaling $11,577,251.00. The projects goals and objectives are many and include, increasing student academic success in Pre-Algebra, Algebra I, and English. To increase student and family participation in college prep/readiness activities and knowledge of financial aid options. The program is designed to maintain 100 percent high school graduation rate, increase test scores on the ACT exam, increase the rate of student acceptance to colleges and decrease need for post-secondary remediation. The program will serve up to 2,070 students at ten secondary schools in the IDEA charter school district, which include, IDEA College Prep Alamo, Donna, Edinburg, Frontier (Brownsville), Mission, Quest (McAllen/Edinburg), San Benito, San Juan and Weslaco. Congressman Henry Cuellar, D-Laredo/McAllen was honored on Wednesday, April 25, as a “Champion of Healthcare Innovation” by the Healthcare Leadership Council, a coalition of leaders of the nation’s premier healthcare companies and organizations. The award ceremony took place in Washington, D.C.
Cuellar received the recognition during the Council’s annual Healthcare Innovations Expo on Capitol Hill. 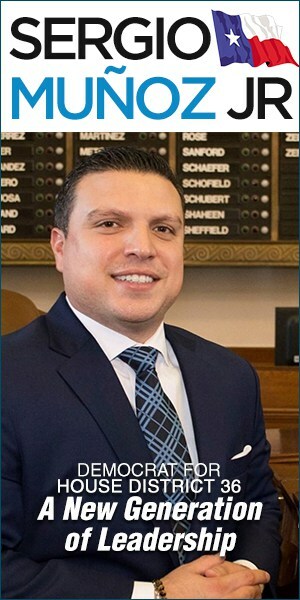 At the expo, Cuellar spoke to representatives from healthcare companies about new developments in health care technologies, treatments and practices. Robert M. Walton, former Medical Center Director of the White River Junction VA Medical Center in Vermont, has been selected as Director of the VA Texas Valley Coastal Bend Health Care System (VATVCBHCS). Walton, who assumed his duties on Sunday, April 22, succeeds former Director Jeff Milligan, who was assigned as the Director of the North Texas VA Health Care System in September 2011. The current Acting Director, Ms. Danna Malone, has resumed her duties as the VATVCBHCS Associate Director. The VA TVCBHCS, headquartered in Harlingen, is the nation’s newest VA Health Care System. The Texas Valley Coastal Bend Health Care System is currently in the midst of an expansion plan that includes construction projects in Corpus Christi, Laredo, and McAllen. A new state law requires those who purchase vehicles in a private sale, whether it’s in or out of state, to obtain a new title within 30 calendar days or face financial penalties. Failure to title within the 30 days results in an automatic $25 penalty, plus another $25 for each month the title is late. There are no waivers for these penalties, which means the Hidalgo County Tax Office and the Texas Department of Motor Vehicles cannot reduce or forgive what you may owe. The law does grant an additional 30 days to active-duty military personnel, which gives them 60 days to transfer the title before facing late title penalties. While the penalties may seem harsh, it’s important to remember this helps to protect a person when he/she goes to sell a vehicle. “When vehicle buyers don’t put the title in their name when you sell them a car or truck, anything they may do with that vehicle is going to trace to your name,” Barrera explained. Sellers don’t have to rely solely on the buyer to do the right thing. Whenever you sell a vehicle yourself or even trade one in to a dealer, it is important to file the free Vehicle Transfer Notification on the TxDMV website, http://www.TxDMV.gov. Buyers need to realize that titling the vehicle in their name also offers protection. “When a vehicle is titled in your name it gives you proof of ownership,” Barrera said. Barrera offers these tips for people planning to buy or sell a vehicle. Texas Buyers • For important protection, never buy a vehicle in a private sale without receiving the title. Be sure the seller gives the buyer the title. If the title is from Texas, one can go to Title Check at http://www.TxDMV.gov to see if it’s a clean title. The seller must sign, date and enter the odometer reading on the title back. Be sure the seller signs, dates and enters the sales price on Form 130-U. If purchasing the vehicle out-of-state, have the seller download the form from the Texas Department of Motor Vehicles website, http://www.TxDMV.gov. Go to the local county tax office within 30 days to title the vehicle in the buyer’s name. Texas Sellers • Sign, date and enter the odometer reading on the back of the title. Fill out the seller’s section of the mandatory Form 130-U. The buyer needs this to title the vehicle out of seller’s name. File the Vehicle Transfer Notification online at http://www.TxDMV.gov to remove seller’s liability for the vehicle in the event the buyer does not transfer the title. The seller has only 30 days to file the Vehicle Transfer Notification to receive this state-guaranteed removal of liability. Congressman Rubén Hinojosa, D-Mercedes, who also serves as 1st Vice Chairman of the Congressional Hispanic Caucus (CHC), on Friday, April 20, joined other members of the CHC, DREAM Act activists and young Latino voters on Capitol Hill to denounce a new and developing version being proposed by Sen. Marco Rubio, R-Florida. First introduced in Congress in 2001, the DREAM (Development, Relief, and Education for Alien Minors) Act proposes to provide conditional permanent residency – in in some cases, could lead to citizenship – for certain undocumented children. A version of the DREAM Act, which passed the U.S. House of Representatives in December 2010 but was blocked from receiving a vote in the U.S. Senate, is supported by Hinojosa. But many Republicans fear that version could lead to amnesty for undocumented residents. Under a proposal being floated by Rubio, undocumented residents who met standards of the DREAM Act could stay in the U.S. indefinitely, with a special immigration permit. But they would have to go through the regular naturalization process in order to receive U.S. citizenship. Among several major provisions found in the Democratic-favored version of the DREAM Act, undocumented children who would qualify must be of good moral character, graduated from U.S. high schools, arrived in the United States as minors, completed two years of college or served in the U.S. military, and lived in the country continuously for at least five years prior to passage of the measure, according to Wikipedia. “When a Republican bill such as the “Rubio Plan” tries to disguise itself as the DREAM Act, it is a slap in the face to anyone and everyone who has any compassion or any sense,” said Hinojosa. The original federal DREAM Act, approved by a bipartisan vote in the House of Representatives in December 2010, was designed to allow undocumented youth who were brought here as children a path to citizenship, provided they either served in the military or attended college. If the “Rubio Plan” is presented, it would be the first time in modern history that someone has proposed a law that would permanently prohibit citizenship to one segment of American society, Hinojosa said. 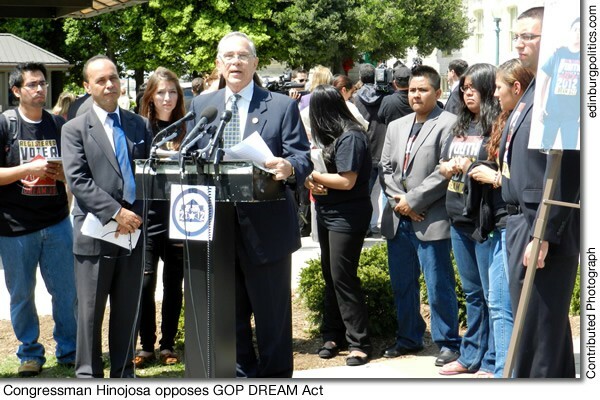 “The U.S. House of Representatives, including my vote, has already approved the TRUE bipartisan DREAM Act,” Hinojosa added. 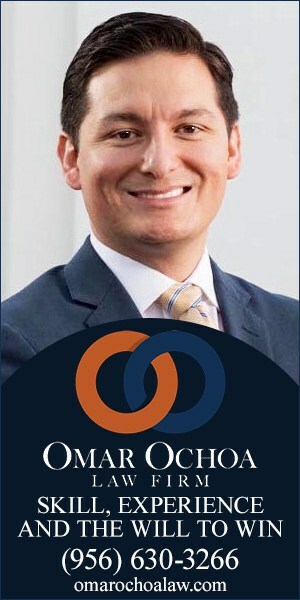 “It is time that our senators do the same because it is the right thing to do.” David A. Díaz contributed to this article. The largest wave of immigration in history from a single country to the United States has come to a standstill. After four decades that brought 12 million current immigrants – more than half of whom came illegally – the net migration flow from Mexico to the United States has stopped – and may have reversed, according to a new analysis by the Pew Hispanic Center of multiple government data sets from both countries. The report, announced on Monday, April 23, is based on the Center’s analysis of data from five different Mexican government sources and four U.S. government sources. The Mexican data come from the Mexican Decennial Censuses (Censos de Población y Vivienda), the Mexican Population Counts (Conteos de Población y Vivienda), the National Survey of Demographic Dynamics (Encuesta Nacional de la Dinámica Demográfica or ENADID), the National Survey of Occupation and Employment (Encuesta Nacional de Ocupación y Empleo or ENOE), and the Survey on Migration at the Northern Border of Mexico (Encuesta sobre Migración en la Frontera Norte de México or EMIF-Norte). The U.S. data come from the 2010 Census, the American Community Survey, the Current Population Survey and the U.S. Department of Homeland Security. This sharp downward trend in net migration has led to the first significant decrease in at least two decades in the number of unauthorized Mexican immigrants living in the U.S. – to 6.1 million in 2011, down from a peak of nearly 7 million in 2007. Over the same period the number of authorized Mexican immigrants rose modestly, from 5.6 million in 2007 to 5.8 million in 2011. Mexicans now comprise about 58 percent of the unauthorized immigrants living in the United States. They also account for 30 percent of all U.S. immigrants. The next largest country of origin for U.S. immigrants, China, accounts for just five percent of the nation’s stock of nearly 40 million immigrants. Apprehensions of Mexicans trying to cross the border illegally have plummeted by more than 70 percent in recent years, from more than 1 million in 2005 to 286,000 in 2011 – a likely indication that fewer unauthorized immigrants are trying to cross. This decline has occurred at a time when funding in the U.S. for border enforcement, including more agents and more fencing, has risen sharply. As apprehensions at the border have declined, deportations of unauthorized Mexican immigrants – some of them picked up at work or after being arrested for other criminal violations have risen to record levels. In 2010, nearly 400,000 unauthorized immigrants – 78 percent of them Mexicans – were deported by U.S. authorities. Although most unauthorized Mexican immigrants sent home by U.S. authorities say they plan to try to return, a growing share say they will not try to come back to the U.S. According to a survey by Mexican authorities of repatriated immigrants, 20 percent of labor migrants in 2010 said they would not return, compared with just seven percent in 2005. The report, Net Migration from Mexico Falls to Zero – and Perhaps Less, authored by Jeffrey Passel, Senior Demographer, Pew Hispanic Center, D’Vera Cohn, Senior Writer, Pew Hispanic Center, and Ana González-Barrera, Research Associate, Pew Hispanic Center, is available at the Pew Hispanic Center’s website, http://www.pewhispanic.org. The Rio Grande Valley Hispanic Chamber of Commerce will host a Mothers Day Extravaganza on Thursday, May 10, from 5:30 p.m. to 8:30 p.m. at the Legacy Event Center in Edinburg. The highlights of the evening will include the announcement of the “Mother of the Year”, when five deserving women – living and deceased – will be recognized for their remarkable lives. Nominations are being accepted for the award until May 4 with an essay of up to 500 words explaining why a person’s mother is so special. For more information on the Mothers Day Extravaganza and for the nomination process for Mothers of the Year, individuals may call the RGVHCC office at 928-0060. Tickets for the event are $25 each, reserved tables of 10 are $300 (with priority seating), and sponsorships that include a display table range from $500 to $3,000 each. Exhibitor tables are also available for those wishing to sell their items or services. A Style Show is also included to highlight some of the latest fashions on the market. Enjoy the show as they model casual, business and evening attire for all ages. A special Mother and Daughter show will also be presented. Area businesses who are sponsoring the event include WalMart, Spa La Posada, Bec’s Fashions, Our Secret, Boot Jack, Wells of Weslaco, and Olivia’s Fashions. Texas Attorney General Greg Abbott and 15 state attorneys general on Wednesday, April 11, charged three of the nation’s largest book publishers and Apple Inc. with colluding to fix the sales prices of electronic books, known as eBooks. The states’ antitrust case, which was filed in federal court in Austin, cites the defendants for violating the states’ antitrust laws and the federal Sherman Antitrust Act. 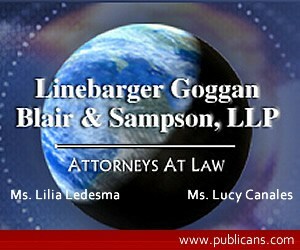 The states’ antitrust action stems from a two-year investigation, led by the Texas Attorney General’s Office and coordinated with the offices of the Connecticut Attorney General and the U.S. Department of Justice, into allegations that the defendants conspired to raise eBook prices. For years, retailers sold eBooks through a traditional wholesale distribution model, under which retailers, not publishers, set eBooks’ sales prices. However, the investigation revealed that Penguin, Simon & Schuster and Macmillan conspired with other publishers and Apple to artificially raise prices by imposing a distribution model in which the publishers set the prices for bestsellers at $12.99 and $14.99. When Apple prepared to enter the eBook market, the publishers and Apple agreed to adopt an agency distribution model as a mechanism to allow them to fix prices. To enforce their price-fixing scheme, the publishers and Apple relied on contract terms that forced all eBook outlets to sell their products at the same price. Because the publishers agreed to use the same prices, retail price competition was eliminated. According to the states’ enforcement action, the coordinated agreement to fix prices resulted in eBook customers paying more than $100 million in overcharges. The states’ antitrust action seeks injunctive relief to reverse the effects of the defendants’ anti-competitive conduct as well as damages for customers who paid artificially inflated prices for e-books. The states have reached an agreement in principle with Harper Collins and Hachette to provide significant consumer restitution as well as injunctive relief. Texas was joined in the April 11 enforcement action by Alaska, Arizona, Colorado, Connecticut, Illinois, Iowa, Maryland, Missouri, Ohio, Pennsylvania, Puerto Rico, South Dakota, Tennessee, Vermont and West Virginia.